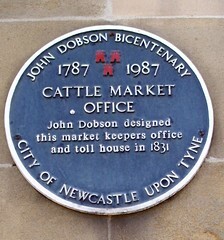 John Dobson (1787 – 8 January 1865) was a 19th-century English architect in the neoclassical tradition. 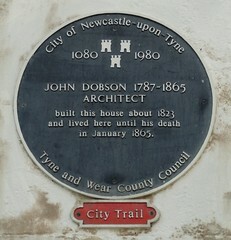 He became the most noted architect in the North of England. Churches and houses by him dot the North East - Nunnykirk Hall, Meldon Park, Mitford Hall, Lilburn Tower, St John the Baptist Church in Otterburn, Northumberland, and Beaufront Castle among them. During his career he designed more than 50 churches and 100 private houses. 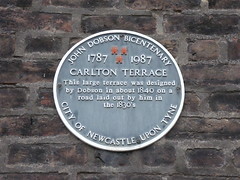 However, he is best known for designing Newcastle Central Station and for his work with Richard Grainger developing the centre of Newcastle in a neoclassical style. Newcastle Central railway station. 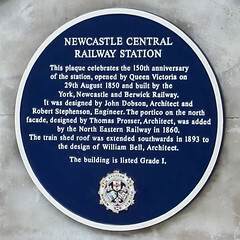 This plaque celebrates the 150th anniversary of the station, opened by Queen Victoria on 29th August 1850 and built by the York, Newcastle and Berwick Railway. 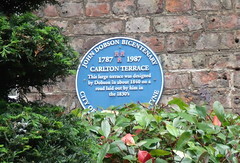 It was designed by John Dobson, Architect and Robert Stephenson, Engineer. The portico on the north facade, designed by Thomas Prosser, Architect, was added by the North Eastern Railway in 1860. The train shed roof was extended southwards in 1893 to the design of William Bell, Architect. The building is listed Grade 1. 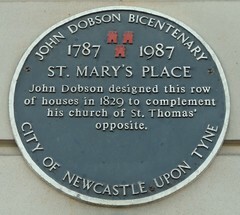 St. Mary's Place John Dobson designed this row of houses in 1829 to complement his church of St Thomas' opposite. 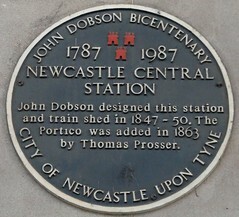 Newcastle Central Station John Dobson designed this station and train shed in 1847-50. The Portico was added in 1863 by Thomas Prosser. Eldon Square. 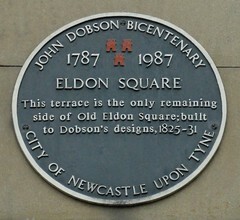 This terrace is the only remaining side of the Old Eldon Square; built to Dobson's designs; 1825-31. Grainger Market. 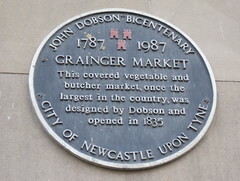 This covered vegetable and butcher market, once the largest in the country, was designed by Dobson and opened in 1835. Grey Street. 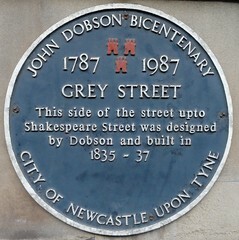 This side of the street, up to Shakespeare Street was designed by Dobson and built in 1835-37. The Guildhall. 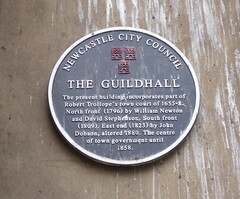 The present building incorporates part of Robert Trollope's town court of 1655-8. North front (1796) by William Newton and David Stephenson. South front (1809). East end (1823) by John Dobson, altered 1880. 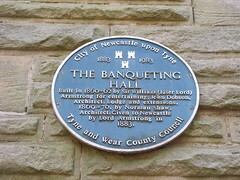 The centre of town government until 1858. 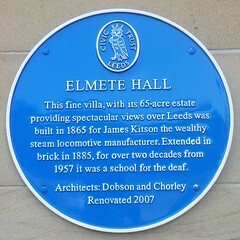 Elmete Hall. This fine villa, with its 65-acre estate providing spectacular views over Leeds was built in 1865 for James Kitson the wealthy steam locomotive manufacturer. Extended in brick in 1885, for over two decades from 1957 it was a school for the deaf. 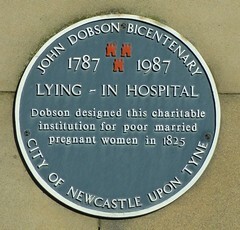 Architects: Dobson and Chorley. Renovated 2007. 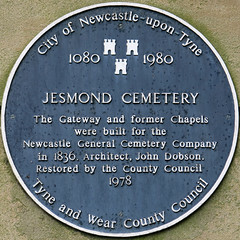 Jesmond Parish Church. Designed in 1858 by Dobson and built in memory of the notable preacher Richard Clayton. Carlton Terrace. 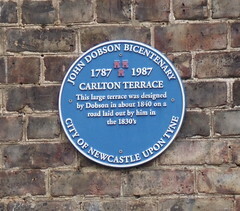 This large terrace was designed by Dobson in about 1840 on a road laid out by him in the 1830’s.